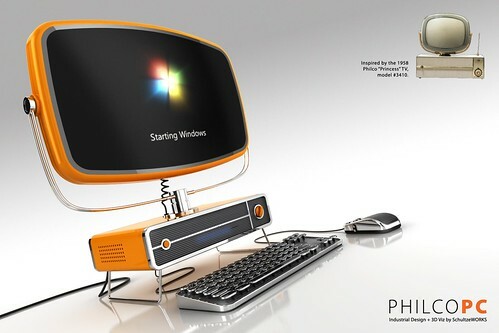 SchultzeWORKS designstudio (www.schultzeworks.com) of Pasadena, CA is proud to announce its top three placement in a recent design competition with their “radical reinvention of the personal computer,” titled ‘Philco PC.’ The competition was sponsored by ASGVIS, makers of V-Ray for Rhino, the 3D rendering technology for the Rhino modeling software used to create the project. Philco PC by Dave Schultze is licensed under a Creative Commons Attribution-Noncommercial-No Derivative Works 3.0 United States License. Based on a work at www.schultzeworks.com. Permissions beyond the scope of this license may be available at http://www.schultzeworks.com/creative-commons. Thank you to everyone who has called or written to inquire where they could buy the Philco PC. However, these images are 3D renderings of a design concept which does not yet exist in the real world. We are currently meeting with PC manufacturers and hope that will change in the near future. In the meantime, thanks for the interest, and it’s very cool that you thought the images were real.